Laser tag is a beautiful game. I remember never getting enough of this beautiful game as a child. My older brother and I would spend our days playing and it was hands down the best fun I’ve had in my life. Laser tag isn’t just a game about shooting and chasing each other around the house and the backyard; it’s about learning to be patient and to pursue goals single-minded. It’s about bonding between friends and laughing together. That’s why I love it so much, and I’m willing to bet you do too, especially since you’ve come to read this review. 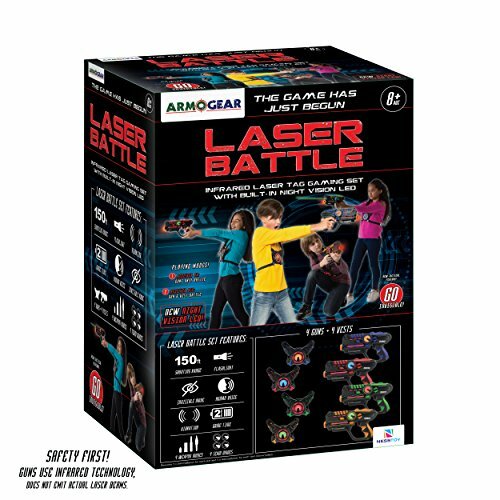 Armogear laser tag is also available in a 2 pack! 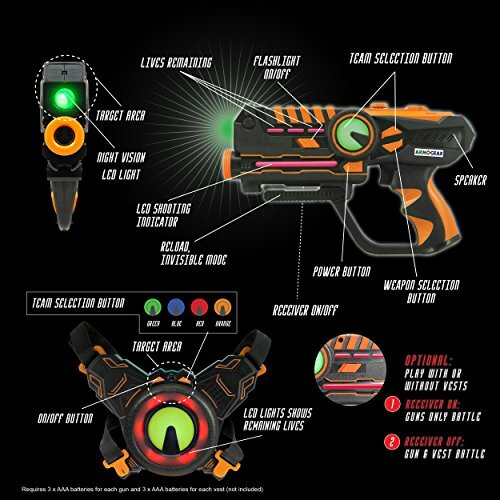 Let’s have a closer look at the main features of the Armogear laser tag system. The ArmoGear Infrared Laser Tag Guns and Vests is one of those laser tag sets that blend the old and the new in a beautiful way. The latest sets feature sensors on the blasters, meaning you don’t get the vests. That’s all good but I personally love the old school method of wearing a vest when I play laser tag. The good people at ArmoGear understand this. That’s why they made a set that includes vests while still integrating sensors into the blasters themselves. It’s a great blend of old-school style with modern technology. I also loved the color scheme. It was retro-styled and very nostalgic. The design of the guns was pretty aggressive, getting me into the mood for a battle immediately. They were also color-coded to allow team play. The whole set was packed with a ton of exciting features that just stole my heart. These guns have incredible range. One of the biggest pet peeves I have with laser tag sets is the range. You’ve got a great set that seems to have all the bells and whistles but it all proves useless once you start playing the game. You spot your opponent on the far side. They haven’t seen you yet, so you set yourself up for the perfect shot; only you can’t because they’re too far away. God knows how often I’ve been through the above scenario. The ArmoGear blasters solve this with a more than generous 150-foot range that makes sure you can get precision shots from a great distance away. The features on the blasters don’t end there. They also feature multiple firing modes that really speak to their versatility as laser tag guns. Would you like to be a gunslinger with a regular pistol? The blaster has pistol mode for that. Would you like to go all commando on your opponents and drill your machine gun? There’s machine gun mode for that. Would you like to give them powerful shots that go for maximum damage? Why don’t you try shotgun mode? There’s also rocket mode which takes everything to the next level, making sure you obliterate your enemies with no chance of a comeback. All of these modes can easily be accessed at the simple press of a button. The blasters are also pretty interactive, with sounds that match the different modes and lights that make them even more fun to play with. You’re sneaking up on the enemy. You know you have to be in absolute stealth mode so they don’t know what hit them. One breath too loud, one footstep too heavy and they’ll be onto you. But how do you get the lights on the gun to go off? With other laser tag guns, the lights, which are ideally supposed to be fun, stay on the whole time. There isn’t anything necessarily wrong with that, except it makes stealth practically impossible. The ArmoGear blasters allow you to turn off the lights so sneaking up on your enemies will be super easy. They’ll never know what hit them. There are so many great features on this laser tag set that I can’t possibly list them all. I will, however, tell you about the best. The night vision flashlight has to be an honorable mention on this list. Maneuvering around in the dark can be a bit of a bother when you’re playing laser tag at night. I’m always of the opinion that if you’re going to play at guns you should feel like you really are a soldier, or a navy seal, doing some exciting stuff in the field. We all know that those guys have night vision goggles that keep their eyes open even in the dark. The ArmoGear laser tag blasters feature a night vision flashlight that gives you the exact same feeling. The set also supports multiplayer multi weapon games with up to 4 teams. That makes it all the more exciting as you can have an all-out war with your friends and see who wins. The guns also have some great vibrations, sounds, and lights to make everything even more exciting. Finally, this set features highly durable guns and vests made out of premium quality materials. You’ll be using them for a very long time. You might even get to pass them on to your kids! 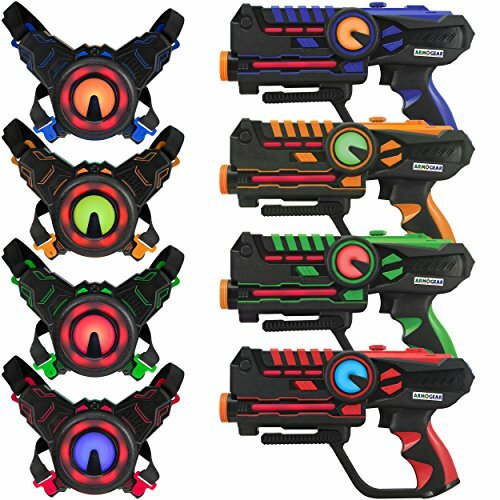 The ArmoGear laser tag set gives you the option of either using the blasters as receivers or going old school and using the vests as receivers. This kind of versatility makes it an excellent choice for people who want the freedom to choose how their game play will be. 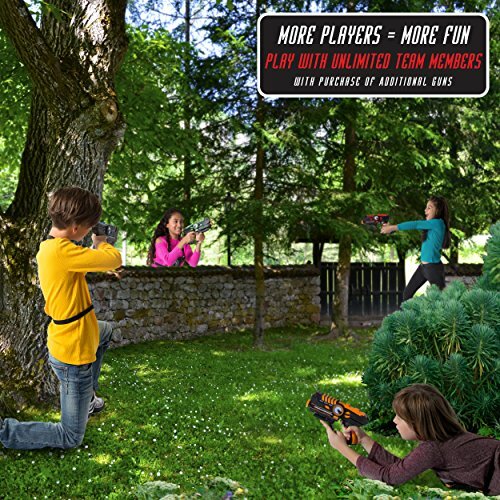 At the time of this writing, there were 130 reviews of the product on Amazon and they awarded the ArmoGear laser tag guns and vests an average rating of 4.5 stars out of five with 79% of the reviewers awarding the product a full 5 stars. The reviews were positive overall but I noticed some customers complaining about how loud the guns were, especially when used indoors. One customer remarked “I won’t let my kids use it… even if they want to”. Even though this is a legitimate complaint, I feel like it’s something you can live with, considering how great all the other features are. Perhaps it would be best to restrict play to the outdoors to avoid ruffling anyone’s feathers indoors. I’m pretty confident that, given how the pros and cons compare, the ArmoGear laser tag guns and vests set is a worthy purchase.